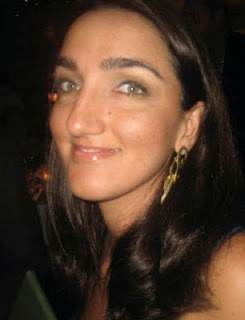 I turned thirty six last week! My third Jupiter Return is something to celebrate and hopefully it will send me into the future with a lot more oomph. 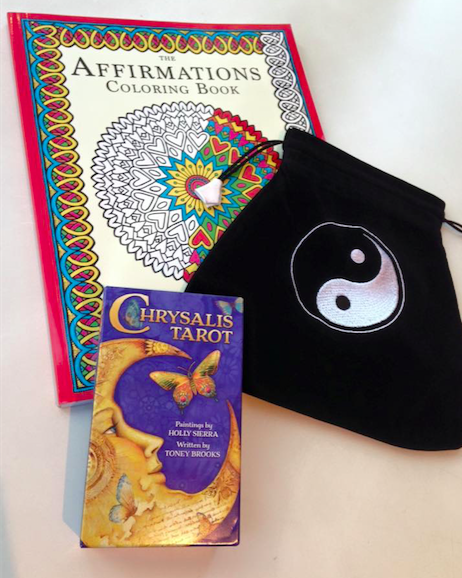 My favorite presents this year were the goodies in the picture to your left: an Affirmations Coloring Book by Hay House, the Chrysalis Tarot deck and a neat little tarot bag with a yin-yang sign on the cover. The tarot deck I was expecting and I love it; the past couple of months I had been using the iPhone app so I already knew how beautiful the cards were. The coloring book was a complete surprise and I have already spent at least a few hours filling in the mandalas while reciting the affirmations that go with them. The coloring book was created by Louise Hay, author of You Can Heal Your Life, and Alberta Hutchinson, a mandala artist and author. The funny thing about coloring books is they take you back to childhood, when things didn't have to be perfect to be beautiful (This might be the Virgo in me speaking up). At first I was stressing, yes stressing, over the colors I wanted to use and if they would match. My first task was to color in the border around the affirmation, I Breathe in Love and I Flow with Life. Blue is one of my favorite colors so I used that on one of the threads that weaves all around the page. 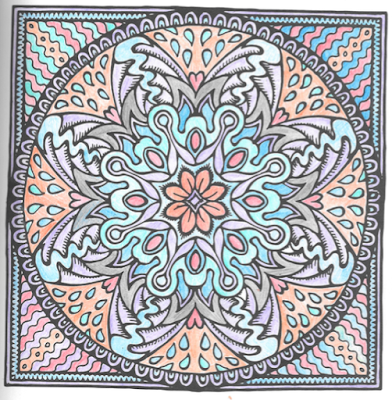 Then I wanted to use a second color to interweave with that one and I reached for purple. I colored in one link, decided I didn't like it, and reached for green, then red, then turquoise. Eventually I decided to alternate between the lot of them, and the final result was even prettier than I had imagined. Mistakes can be beautiful too, and art (if you call coloring art) doesn't have to be perfect to be your very own masterpiece. This whole time I went on repeating the affirmation while consciously breathing in love and breathing out stress. The end result is one that I was pleased with. Anyhooo, I thought I would share my experience, if anyone wants to work with mandalas or affirmations. Until now I had only done repetitions, following the suggestions on the popular psychic blog A State of Mind (see link). 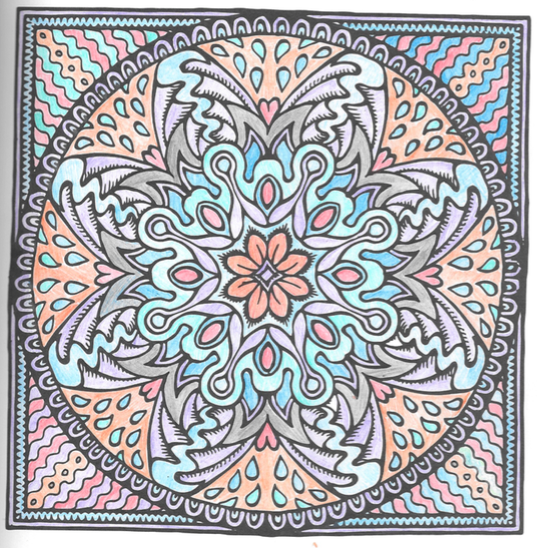 I have to confess that I prefer the coloring book because it is more fun, and it feels like you are coloring the affirmation into your subconscious. I thoroughly enjoyed the experience!